Motorola Admiral goes official on Sprint | Android Blast! OVERLAND PARK, Kan., and LIBERTYVILLE, Ill. - Oct. 20, 2011 - Sprint (NYSE: S) and Motorola Mobility, Inc. (NYSE: MMI) today announced the availability of Motorola ADMIRAL�, the first smartphone that boasts Sprint Direct Connect� speed, powered by Android�. It goes on sale in Sprint direct ship sales channels, including Sprint Business Sales, Telesales (1-800-SPRINT1) and Web Sales (www.sprint.com) and can be ordered at Sprint Stores beginning Sunday, Oct. 23, for $99.99 with a new line or eligible upgrade and two-year service agreement, after a $50 mail-in rebate via reward card1. It will be available Sunday, Nov. 13, through all Sprint sales channels. Ready for the toughest conditions, Motorola ADMIRAL is designed to meet Military Standard 810G for dust, shock, vibration, solar radiation, low pressure and high and low temperatures. 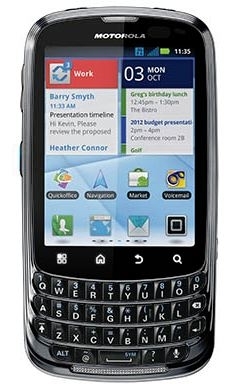 Plus, with Corning� Gorilla� Glass�, Motorola ADMIRAL�s touchscreen display is scratch-resistant. Sprint Direct Connect - Instant, one-to-one push-to-talk calling nationwide on the Sprint network, with any other Direct Connect subscriber. Direct Connect is the core push-to-talk feature and is designed for interoperability across Sprint and Nextel network platforms. Guaranteed Talk Permit - The assurance that when you hear the push-to-talk �chirp� that your call was successfully transmitted. Call Alert with Text - Send an audio alert with an optional text message to let another Direct Connect subscriber know you are trying to reach them and why. Group Connect� - Communicate with up to 20 other Sprint Direct Connect subscribers all at once - nationwide, at the push of one button. TeamDCSM - Communicate with up to 200 other Sprint Direct Connect subscribers at the same time nationwide2. NextMail� - Send a recorded message to any email worldwide or mobile handset via text message by using the Direct Connect button. Availability Notification - Request the availability status of another push-to-talk member and, if they are busy, request a notification when they are free. With more than 18 years of expertise, Sprint is the industry leader in push-to-talk, serving the world�s largest push-to-talk community with millions of Direct Connect subscribers. Direct Connect from Sprint has set the industry standard for push-to-talk worldwide. A pioneer in push-to-talk technology, Motorola Mobility has been providing devices for the push-to-talk community since the network�s inception. With the introduction of Direct Connect from Sprint, Motorola Mobility continues to innovate and provide reliable and compelling products that utilize the latest push-to-talk solutions. For consumers, Sprint�s Everything Data plan with Any Mobile, Anytime includes unlimited web, texting and calling to and from any mobile in America while on the Sprint Network, starting at just $69.99 per month plus required $10 per month Premium Data add-on for smartphones and $5 Direct Connect add-on. Simply Everything delivers unlimited web, texting, calling and Direct Connect for $99.99 per month plus required $10 per month Premium Data add-on for smartphones.